Instead of focusing on the things you think you want to keep or don’t want to keep focus on what you want the ultimate outcome of your decluttering to be. Like Whisper, if you want to reduce a certain category by half focus on reducing by half and don’t allow half hearted interest in certain items to convince you to keep them. Take my kitchen for example. I have revisited the decluttering task in my kitchen over and over again. My kitchen items probably take up only two thirds of the space they used to. I have chosen to keep several things in the past just because they are aesthetically pleasing, suit my tactile nature or just in case I need them one day. But what I really want is to reduce the items to at least half of the original quantity. I don’t need three different sets of bowls that can perform the same task just because they are all lovely in there own special way. I also don’t need four casserole dishes that haven’t been used in twelve months. I could keep two just in case and declutter the rest. I know that I can always replace them guilt free by picking up secondhand ones at the thrift store in the unlikely event that I might someday have a need for them. Not that I think this will ever be necessary. Now that I think about it I believe most of the items I have mentioned came to me secondhand in the first place. So to put this plan in a nut shell ~ Just choose your goal and only keep the items that you want, need or like the most to fit with that goal. If your desire to declutter is strong enough this really won’t be a challenge. Declutter something that you keep in case of an emergency that never arises. Perhaps your first aid box needs decluttering or maybe you kept that pair of crutches from a previous injury like I have. Granted, I have used my pair on three separate occasions, but three times in seven years doesn’t justify keeping them. 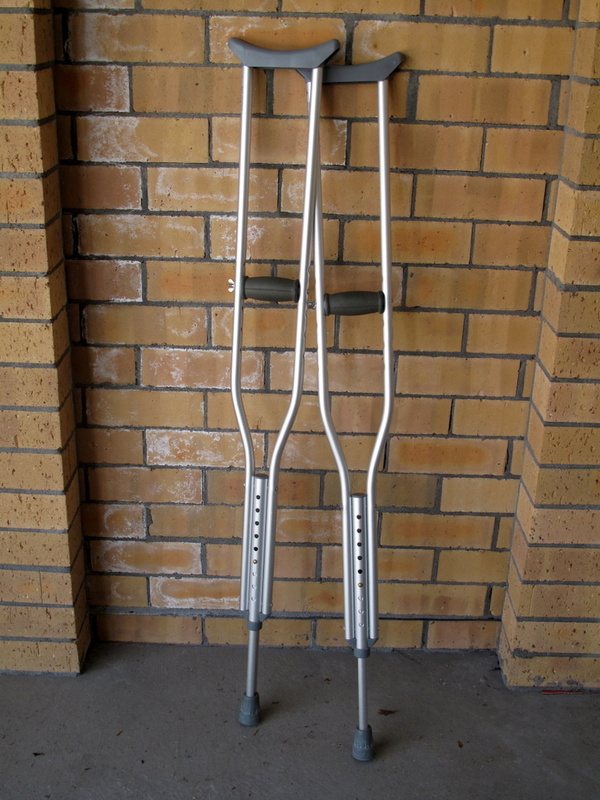 As per today’s mini mission here are the crutches I am decluttering today. Hopefully my optimistic attitude of not needing them again in the future will hold true to reality. I wasn’t looking forward to housecleaning yesterday but it feels so good now that it is done. I am grateful that the task is made easy by the fact that there is so much less to dust and shift after all my decluttering. I find time to deviate off the usual tasks to accomplish a few extras because if this. Please to be of service Sanna and good for you. As I said in the post, I work this way often when it comes to decluttering. It never takes me long to figure out what I want most, the item and all that entails (storage, cleaning etc) or the space and simplicity of owning less. This is a wonderful idea to take the declutter process a step further. I can definitely use this advice! You run with it then Jo. I think this is where I am right now. We’re moving next month into a larger apartment, but I want to get rid of all the stuff that isn’t worth the hassle of moving it (even if it is just down the street at the same complex). It’s been years since I went through all the obvious things that can go, as well as a few rounds of the not-so-obvious things. Since I have this goal in mind with a deadline, it does make more sense to decide what I want ideally, and then go from there instead of hemming and hawing over sort-of loved items. Thanks for this one! Hi Faith – I think it is an awesome opportunity to get rid of everything that you don’t love or don’t want to actually shift on the day. True..I think that’s the only thing I like about moving! My pleasure Faith and I hope your move and the decluttering goes well. This is so helpful! Sounds like a great approach specially for jewelry. I always find that since my jewelry is organized and contained that I tend to keep more than I need. I do have a lot of it though and while I wear jewelry all the time, I do favor some over others. I find that every time i try to cull i only end up getting rid of a couple of things only because its nOt in the way. This approach sounds manageable and helpful. I can understand where you are coming from, I also haven’t bothered to declutter much of my jewellery for the same reason, it is neat, tidy and doesn’t take up much space. However it is also not worn so much, getting tarnished from disuse and wasted languishing there. So I took my own advice on this and declutter a huge chunk of it. I am not a # or % declutterer. I just keep want I want, period. Does not matter to me where I started and what % I end up with, rather the whole issue for me is my happiness with what’s left. Good for you Gail, decluttering is an individual journey for us all. My goal is to be able to downsize my home (less carbon footprint) and not have lots of stuff languishing unused while I travel more in the future. Plus I find the less I have the less effort it takes keeping it in order. When I first read this, I thought you were letting us know in no uncertain terms you are NOT a declutterer! Just goes to show, how we sometimes have to have a second look at things to see them clearly. I agree with you Gail, it is the happiness that follows a declutter, that is the real measure! Still loving your words Colleen and reading everyones wonderful comments . I think jewellry for me is like clothing. Don’t keep what you always pass over for something else. Given I wear a uniform (and no jewelry) most week days, there’s no need to have a huge collection. More of my friends are men than women, and I’m pretty confident they don’t care (if they even notice) if I wear the same necklace twice in a month! That sounds reasonable to me Snosie. Although I wouldn’t care what other women think either. Hi Colleen – great post – when I started out I set myself percentages to eliminate because it gave me a number to work towards, but along the way I realised that I wanted more than 20% gone from our house and what a cool feeling it was hiffing things out, I wanted everything that I didn’t like, didn’t want, didn’t fit and didn’t use out. Then my focus changed. I started getting rid of the things that survived several culls, it was like their value whether monetary or sentimental dropped each time I had to re-stack them back into the cupboard, or maybe I realised this was the only time those items ever saw the light of day. Then I realised my goal of 20% was already in the rear view mirror, but for the first time I had an idea of what I wanted my home to look like and function like, and this picture of my home is now what I go by. The only thing is that some mornings when I get up, I’m a little bit surprised that my house doesn’t quite match the one in my head! Good strategy Moni, just keep working towards that picture in your head. Mind you I think that any mothers picture of what there home should ideally look like isn’t going to manifest itself until the children leave home or at least grow past their messy stage. Luckily I can contain most of the mess to my sons room. That is until end of semester draws near and his artwork starts flowing out into other areas of the house. Colleen, you could probably identify with this: being the last person to bed, leaving the kitchen immaculate, then being the first person up in the morning and the kitchen is covered in what appears to be a midnight feast. 17 year old son said he got hungry during the night, and I’m saying ‘how can you be hungry if you were asleep?’ but apparently you can! Or at least he can. That was my pet hate! It was getting so bad waking up and the sink covered in dirty dishes that a solution had to be found. Now, everyone washes their own dishes after use. A week of subtle reminders that no one likes to clean up other peoples mess , especially me. I also Threatened to have plates DNA tested to discover the culprit. I even left a pile of eldests sons dirty cups and plates for him to view each time he walked into the house, just to remind him how much mess he casually left behind after his late night feasts. Everything is now washed and left to dry on the drainer. I really don’t mind putting away clean plates. And no one can hide their dirty plates amongst those left on the sink. Wendy – I like the threat of DNA testing! This is normal activity for my son. Most of his uni classes are in the afternoon and three times a week he works the graveyard shift at McDonalds so he is a night owl the sleeps late and wakes up late. I would find it weird if he hadn’t been up making a snack in the middle of the night. I am confused as to how he stays so slim. Hi Dizzy – it is great when a guy is house trained, can he cook? I have told them that if I buy them a new book they have to get rid of an old one, and so far they haven’t received any new ones; the local library is getting a good workout though!! Hi Loretta – books are also my weakness and I also had thousands of books but now I have a kobo e-reader and am slowly getting rid of my books. My kids eventually came to the party with getting rid of books – though only ones that they’d outgrown – by offering them the proceeds from selling them on trademe (ebay) – boy they couldn’t get them out to me any faster. My younger daughter decided to take over my husband’s e-reader (he’s only a vacation reader) and used some of her book-sale money to buy some digital books for it and now she is hooked. Our city library has just announced they are doing e-book hireage, so we’re also looking into that. My older daughter who really loves holding the book and was resistant to an e-reader, has worked out that she has to read six books this year for school, and the savings alone from each book (between 20%-25% per book) alone will pay for her to get an e-reader, and the girls discovered there is a search option where you type in a word or a name and it brings up a list of all of them in the book. Considering they are expected to provide quotes from within the book to back up all comments and opinions, this has proved invaluable. Courtney did Haymitch from The Hunger Games, so she typed in Haymitch and six pages of quotes/mentions to scroll thru. Saved her so much time. And when you factor in that I have three at High School (we actually call High School “College” here but it isn’t College like in America) this is really handy. Hi Loretta – I used to love seeing all my books on the shelves but they took over. Now my kobo goes everywhere with me, battery lasts about 3 weeks. I was at the shopping mall recently when they had a fire drill and we had to evacuate out to the carpark while they ran around practicing evacuating people. Everyone was complaining as we weren’t allowed to go to our cars and leave. Me I was happy as a clam as I pulled out my e-reader and started reading. Its sooooo coool having all my library at my fingertips now. The other benefit is that it is so light weight as I had a wrist injury and can’t comfortably hold up a Diana Gabaldon book after about 5 mins now, so that was what prompted me into it. I’m just about to get myself an iPod touch – I did buy myself one some years ago but my daughter offered to set it up for me and that was the last I saw of it! Good example of how and why this method works Loretta. Well done. First-time poster here. Totally agree with this approach. Envisioning what I want my home to look like, both in visual terms and in the level of maintenance I’m willing to invest in it, is way more motivating than the endless inner thrashings over What to Keep. Thank you! Since discovering your site a few weeks ago, my decluttering efforts have hurtled to the next level, and I’m putting a lot more stuff out for Freecycle now. Grateful thanks for this. I’m so happy to have found a whole site devoted to decluttering… happy sigh. I’ve been at the decluttering game a long time. Accordingly to my journal I’ve been at this since at least 2000! That’s not an especially happy thought, so it’s high time to pick up the pace and eliminate the annoyance and time-drain of the excess baggage once and for all! Holding out incentives for myself like being able to do a Flylady-style floor cleaning in a tenth the time it currently takes, because I won’t have to pick up two dozen things to do it. Books will be the last frontier in my decluttering journey and as a former homeschooler, we’ve got plenty! I’m pushing that project off, just nabbing a book or two here and there as I see one that doesn’t meet your “joy” criteria: “Could someone else be getting more joy out of this than I currently am?” That was a great insight for me and is making it easier to let things go. This week’s dejunking highlight was a pair of large retro lamps, circa 1960, cream-colored ceramic with gold flecks and ugly, yellowed shades. So happy to see them go! The Freecycler who picked them up knew that the switch on one of them was faulty, but he assured me that he fixes lamps “all the time.” I just love Freecycle. The appropriate recipient basically self-selects themselves. Looking forward to learning more from you all. Hi Vicki S. and welcome to 365 Less Things. Thank you for dropping in to introduce yourself and what a great comment you have left for us. 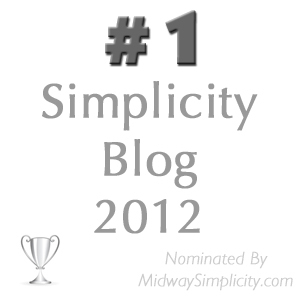 I am so glad that my blog has inspired you to crank the decluttering up a notch in your home. Wow, decluttering since 2000 is a long time, here’s hoping with a little encouragement here at 365 Less Things you will be able to let go of lots of things you hadn’t considered before. Focusing on that goal to having an easy maintenance home should be good incentive. If you feel like you want to leave the book until last then why not. So long as you are decluttering something it doesn’t matter what order you work in. And don’t you just love Freecycle. A lamp was one of the first things I decluttered there. It needed rewiring but the lady who picked it up has a son who was an electrician. He was probably cursing me but thats not my problem. So Vicki, drop in a keep us up to date with your progress as often as you like. We are always here to listen and encourage. Thanks for the warm welcome, Colleen! I like this post. It makes me think about how to talk with my mother about some things that need to be decluttered. I really like the idea of getting a picture of your house and then working toward that picture. I had an interesting conversation with a friend today. She is leaving on a month long trip this Thursday. She is going to be visiting with family. She was talking about how many clothes she had and how she hated taking so much luggage. I told her to take less. She gave me an excuse but I told her that my entire wardrobe would fit in a carry on. She seems to think she needs all these clothes. She has closets filled. Tomorrow I am going to her house to help her get a handle on her paper clutter (bills, 401K statements, etc.). While there I think I am going to start working on doing a declutter of her closet when she gets back. Hi Deb J – the irony is that up until then I wasn’t a “visualise” person, but its very firm in my head now. I have also promised myself rewards that I can’t have until each room is completely done. For example I’d always wanted one of those faux fur blankets to have at the end of my bed, so once I’d completely decluttered/minimised my room and kept it that way for a two months, I bought the blanket – and it was on special too – and I’m quite chuffed every time I see it. And the cat especially loves it. Clothes – Dizzy and I heard about Project 333 on this site and I was quite nervous about having 33 items of clothing for 3 months, but it has been easy. I haven’t missed anything else that I packed away, and to be honest have decided at the end of the 3 months I will get rid of them. It sounds scary at the outset, and I thought it would be stressful having to think of mix & match combinations to make it go further, but its been no drama at all, actually it has made it easier. The less I thought about it the easier it got. Even if I wear 3 items per day, that is still 10 days worth. And yes all my clothes can now fit in a suit case if I wanted to. Project 333 might be a bit extreme for your friend. Early on in my decluttering we did the coat hanger thing where you hang the coat hanger in reverse, ie you have to slip it behind the hanging pole to hang it. Then as you wear clothes you put them back the normal way. Six months later it is obvious as to what you don’t wear. That might be an easier starting point. Moni, my friend has a rod 12 feet long in her laundry room full of clothes that she seldom wears. They are all aspiration clothes–I might get back down to that size. They have all been there for the 4 years we have lived here. I doubt she will ever get to the 33 idea but if we can get it to where her clothes even fit into her closet that would be a big improvement. She also has 1000’s of books and is starting to put them in tubs so she can sell them. She buys 20 books or so a month. For instance she has every paperback book of Nora Roberts. She has them all in a tub and will sell them as a collection. It took me ages to get her to realize that she will not be able to read them all at some point if she continues to buy them at the rate she does. She is a scrapbooker. She has bags of supplies but doesn’t remember what she has because it isn’t organized so goes out and buys more. I’m going to be helping her with that later in the summer. Hi Deb J – I suggest your friend buys an e-reader (we can deal with digital clutter much much much further down the track) from the proceeds of her book sales. Clothes. 33 would have freaked me out at the beginning and I never had an excessive amount of clothes. But it is surprising to learn how little we do actually need. It is awesome being able to fit everything into my wardrobe, and what is more I no longer need a set of drawers as there is plenty of room to put things like t-shirts and sweatshirts on hangers. Last night I needed to put together an outfit to go out, and I stood there happily wooossshhing the hangers back and forth. Google some sites on basic “how to declutter your wardrobe” and print those out for your friend, they are more entry level and less threatening to. See if you can feel out whether she likes the idea of donating clothes to goodwill, or if there is a consignment 2nd hand clothing store nearby and maybe you will have to do several ‘culls’ so she doesn’t freak out. Could you please keep me updated? I have someone similar that I am going to have to deal with at some stage in the future and I would appreciate the insights. She has kept clothes dating back 40 years! And when she buys something eg a t-shirt, she buys 3 just in case . Moni, my friend does have a Nook and she has many books on it but many times will buy her book at Wal-Mart because it is a little cheaper than getting it for her Nook. I’m encourgaging her to still get them for the Nook because she doen’t have to store them and later try to get rid of them. Today we were looking around the house and I mentioned all of her clothes on that long rod in the laundry room. She said that she needs to go through it and her closets and get rid of a lot of things. When she gets back from her trip we will try to meet once a week and work on things. We will see how things go. Hi again Deb J – Travelling. I’m with Colleen. I was away for 7 days and took 3 changes plus something for going out and it was sooooo easy. Most women like to hit the shops while away so need room in the suitcase for purchases too. Yes I did use a laundromat and no it was no drama at all. One was unsupervised and so I took time out to read my book. Then I found another one where you handed over at the front desk and paid for the extent of service you required ie wash only, wash & dry, wash, dry & fold. So my stuff wasn’t going to go missing, or not get finished if I was delayed returning or had put in insufficient coins etc. My sister has to travel a lot for work and she is the Queen of clever packing, and she mixes and matches a lot, figures out in advance what she’s going to wear on what day, and always checks if the accommodation has a laundry service and if drycleaning can be arranged thru the front desk. And she always looks well turned out. And then she baffles people with this small suitcase. Extra hint – if boots are going to be in your ensemble, wear them on arrival or departure day so that they don’t take up room in your suitcase! I will make sure to let you all know how it goes. How do I handle the tough decisions with a friend? I usually tell them what I do and if that is too drastic for them then I give them some options. I also tend to walk them through some questions about why they are keeping certain things. I have learned that most people haven’t thought things out. So by asking them questions I can get them to where they can make decisions. If they aren’t the decisions I would make that’s fine. Later on, I will ask them how things are going and if they are happy with the decisions they made or want help decluttering more. Usually they are ready to do more. In the case of this paperwork I am working with today my friend didn’t even know what she can get rid of and what she needs to keep for taxes. She didn’t know that she could request an online copy of an end of year statement of all the charges on her charge card for the year. In her case the more we can get rid of the happier she will be. But we have to go through years of stuff to put it in stacks of like documents and then in stacks by year. Once we do that we can then go through and cull all the stuff she doesn’t need. She has many grocery bags full of this stuff. Well, I”m back from my day helping my friend. I ended up starting at the beginnning and helping her set up a budget, filing system, walking her through what receipts and statements she needs to keep and for how long, etc. Some things she was pretty sot on doing her way which will take longer to deal with at Tax time but at least I have her going the right direction. When she gets back we are going to tackle the 30+ years worth of receipts, statements and such that she has in boxes in the garage. I’m thinking of checking into a shredding service and see what it would cost to come to her house and just shred it for her. After that we are going to tackle the craft stuff. We may get done some day. It will never be up to my standards but it will be hugely better and she will be happy with the results. Deb J – just out of interest how long do you have to keep your tax records over there? We have 7 years for business only but are allowed to scan and store digitally. Your tax system sounds a bit more complicated than ours. Moni, actually, we only have to keep our tax record for 7 years. But, I suggest people keep their actual tax forms and any income forms for as long as they work in case they have to prove income to Social Security or something like that. They just don’t have to keep all of the receipts and things to prove their deductions. I have heard of people coming to retirement and having to settle disputes with Social Security or their former wrok place about their length of work or the amount they made. I know one man who worked 3 jobs for a good part of his life and when it came to retirement he was told by SS that the main job he worked with his biggest income didn’t show on their records. If he hadn’t had his income records he couldn’t have proved anything. Good for you Deb J, it sounds like your friend could really do with your help and you should by now have the skills to do just that. Some people don’t realise that when you go on a month long trip you don’t need a months worth of clothes. I have travelled to lots of places and haven’t found one yet that doesn’t have a laundromat. I quite like the hour or two chilling out while the washer and dryer do their thing. It is very relaxing. To fit in with this weeks mini missions theme of obscure clutter I am going to declutter an ironing board today. Yeah! And to fit in with the saturday topic of organizing, too, the ironing board can go (finally! I mean, we had two, so one NEEDED to go, no question) after an organizing session of a certain corner of our home past weekend. We needed to find out how to store the better quality one, but bigger one (came with the BF) before I would let go of the cheap one (mine) that was so neatly stored on hooks behind a door. And we did! And for yesterdays mission we found some filters for a fume hood that don’t fit ours – as they are originally packed they’ll go to the thrift store. Organizing can do wonders sometimes! Now keep your fingers crossed for me when it comes to the “monster” plant he brought with him. It’s far to big for the place and after absolutely not wanting to let it go for weeks now he’s been eying it for a couple of days and thinks about cutting it back. I am trying to instill the thought of better sending it to a home where it would be appreciated for all it’s voluptuous glory instead of cutting all the glory off which actually would be a shame. I am not contra plants – but they need to fit the space and this one unfortunately doesn’t. He’s attached though so I am trying my best to be patient. it sounds like you and the BF are getting along well and learning to compromise when it comes to the combined households. I always say the communication is key to a decluttered home and you and BF are getting a handle on that right from the start. Well done. Actually: it is HARD! We are both in our 30s so there is accumulated stuff and accumulated habits that don’t always go together so smoothly. But I think after quite a rough start we are starting to adjust. I had to realize though that someone who doesn’t have much clutter and somehow who is consciously decluttering are not the same thing AT ALL. There is a lot of clinging on his side and I have to be patient. Up to now the doubles we let go were mostly my stuff but I have the impression that the example is slowly catching on. Doing a lot of decluttering before he moved in definitely saved my sanity (and maybe our relationship because I don’t even want to imagine how the apartment would look if it still had all the stuff in it I once had – it would surely drive us nuts). Don’t let it get you down Ideealistin everyone has to make adjustment when a new person comes into their lives. Boyfriends, girlfriends, husbands, wives, children all disrupt things to a certain degree. Luckily for me I married so young and straight out of living at home so I didn’t have much and my husband lived in single quarters on military bases for the most part so he didn’t have much either. You’d be surprised at how quick the stuff pilled up though especially when our first child arrived two years later. Perhaps it really is best to aspire to minimalism later in life once the children are leaving home. Good luck mate, before you know it life will settle down again to a new normal. It’s been similar here, too. My boyfriend just wasn’t used to decluttering at all, as he never owned so much stuff in the first place. But with all my mad sorting and shuffling and selling, he started decluttering as well. He also has a good collection of comics, which is still taking up a whole bookcase here, but we sold more than 100 comics out of it already- and even threw away some! So it’s decreasing slowly. He also got rid of about half of his wardrobe and some of his dishes. And of lots of other random things – cables and computer stuff and all this crap which bothered me so much in the beginning. I’m still working at the “use it up” things though – especially office and craft supplies. But it’s really getting less. We implemented a buying stop very early in these areas and also for the stuff I sold online, I use almost anything I can find in our stack for packaging: gift bags make great envelopes for books, as do foils or just paper and tape. Sanna – I love your idea about using gift bags for packaging. I have this small pile that I’ve been wondering what I was going to do with them – especially when I have asked everyone to not buy me ‘things’ I can’t really go and buy them ‘things’. Thanks! I’m wondering whether I should rent a shelf at that flee-market-shop around the corner. Sanna, I envy you that you have something like that around. I read about it (here, I think) and thought it sounded great – only to find out that we don’t have one in the city … I’d give it a try! On the one hand there’s the chance for success. On the other hand for the time you rent the shelf, the stuff is out of the house and 150 books is not exactly a small stash … If you decide to go for it: Good luck! At least it feels good to have that stuff gone for the moment. Josh, you never know when you might need any clutter around your house and that is how we end up in a cluttered mess in the first place. 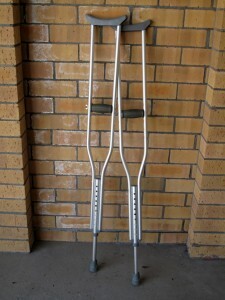 I will take my chances on the crutches. I am sure the hospital will have a pair if I need them. Having my cuppa with the dog by my side while reading through this. Good post! So we’re home now 2 months in our tiny house after years over the pond. I had ‘imagined’ how I hoped for the decor of our house to look (to the point of even ‘drawing’ it on paper). I made the hubbie a deal, he gets a ‘man cave’ (extra bedroom) for his office and closet and music and stuff, and he lets me decorate the rest of the house to my liking (within reason, no major pink or frillies, but those aren’t my liking anyway!). Then my sister came to visit. We hit the thrift stores and malls and décor shops and it was FUN!!! Fun fun fun. Except in all the gazing, I saw stuff that I thought would be perfect in my home, so I bought stuff which did not match my original ‘vision’ and took me down a different decor path. At first I thought all the stuff and the décor turned out awesome and added more personality & ‘umpff’; then the extra décor stuff became ‘too much’ (and it wasn’t really that much) and I wanted my original vision instead! The décor that I tired, not in my initial vision, but because I saw those items and bought them and thought they’d be really awesome, became a burden. Therefore, I went back to my original ‘vision’ and ended up returning a bunch of stuff and also donating other stuff (back) to a thrift store (well, what can I say…). In the end I’m much happier having my original vision in real life; AND realizing that I HAVE to stand firm with what I WANT (not let myself get distracted). The shopping thing has tripped me up over and over and over. While living in Europe I thought I had eliminated that ‘want/need’; but once home all those amazing USA shops pulled me into their vise grip and I was a goner. Good lesson for me to learn, but a waste of time, money and energy (even though I was able to return stuff)!!! But why do I have to learn it over and over? Well, let’s chalk it up to lack of will power while hitting the mall and all those décor and thrift shops. I’ll still hit the thrift shops (NOT THE MALL) and have an EXACT list of what I’m searching for. If I find it, great, if not, I’ll BE PROUD TO WALK OUT OF THE STORE EMPTY HANDED. If I see something that I think I have to have, too bad. I won’t even touch it. I will admire it on the shelf and WALK AWAY (besides, most of the time I get something home and it doesn’t have the same ‘ping’ for me as it did in the store). This can go for other items, too, jewelry, clothing, shoes, etc. Anyone else relate? Oh my can I relate to this. I don’t do it now but I used to. My mother can’t stand for a room to not be decorated so I would eventually give in and go buy things I thought would work in a room. Well, I had the same experience you did only instead of taking things back immediately, I hung on to them until I did find what I wanted and then ditched the old things. I finally realized that I didn’t need to satisfy my mother but me. We have been here 4 years and my bedroom is still pretty bare. Why! I know what I want, can’t afford to get it right now and will not put up anything else until I can get it. It drives my mother nuts because she feels it looks like we spent all the money on her room and then just left mine. I have a bed and a chair in my room. Not one thing on the walls. Oh how she hates that. Ah well Annabelle it is probably like quitting smoking, people often quit several times before they finally get it right. My advice, just stay away. Just like you have to have a cigarette to smoke you can’t shop without a shop. Oh girls all the decorating dilemmas happen to everyone! At the moment I have a pinboard in my scrap/office of heaps of pictures from magazines with decorating goodies all over them. Everybody who sees these pictures oohh and aaarrrhhh over them and say they can’t wait to see what I do in my new house. They get really annoyed when I tell them the only reason I have cut the pictures out are for a reference to the ‘shutters’ on the windows!!! I have a decorating dream of ‘SHUTTERS” I do not want cutains, vertical blinds, horizontal blinds, coloured clings, alfoil or pretty paper!!! AAARRRGGGHHHHH!!!!!! All I want is shutters, in white, on all the windows and maybe white French Doors where all the doors are if not then shutters on the doors as well. That’s it! Believe me ‘Tunnel Vision’ obviously runs both ways!! My friends all look at the ‘STUFF’ I only see the simplicity beyond. I put it down to ‘Brain Change’ !! In my early days of decluttering (and still today, when I feel too tempted), I started cutting out pictures from catalogues and glueing them in a little notebook. It seems that this possibility to “save” them kind of does the trick – as I never really bought one of those things since I started that notebook. It’s full of furniture, decorative items, pottery, flower arrangement and nicely decorated rooms. Occassionaly, but not often, I flip through it, but so far haven’t bought one thing except a little plant for 40 cents, which has lived with us for two months in spring and is now on the balcony of a friend. That funny Sanna as I am kind of the opposite. I would prefer a list of all the things I don’t want in a house. Having lived in six houses in my married life I have come across some ridiculous design ideas or mistakes that I know I absolutely wouldn’t want in a house I own. Mind you have come across some great ideas and designs as well. Like the toilet seat in the bed and breakfast in Seattle on our recent vacation the closed nice and softly like my kitchen bin does. No having to hold it all the way down so it doesn’t bag shut. I love the shutter idea. We can’t have them here because we have so many windows and it would cost a fortune to replace all the mini blinds that were here when we moved in. If I could afford it though, I would get shutters. At one time I lived on the beach in California. We had a great view and had shutters on the windows. It was great. The only time I shut them was when I was dressing or when the sun was beating in the west windows in the heat of summer. Nothing like an unobstructed view. You know you may just have a bit of SAD (seasonal affective disorder). I am told that SAD is the reason I don’t like it when I don’t have lots of light. I have to fight depression when it is gloomy. That’s why the first thing I do in the morning is pull up the blinds on all the windows and let the sunshine in. I have read that when it is gloomy (due to weather or lack of light in a home) you are more prone to buying, hoarding, etc. Am reading archives and found this one. Deb J mentions all the clothes her friend has and the problems of sorting and giving away. Well, I am trying to do the same thing. I love blouses, tee shirts, polo shirts and have quite a collection. Although, I wouldn’t have said that until I decided to put them all together by color BEFORE I go out and buy more. I wanted to find the ones with stains, that didn’t fit and move them out. I have 4 pair of slacks – Brown, black, grey, and navy, yet I must have 30 or more shirts. Hence, the plan to declutter them. I think the plan of turning the hangers backwards will be just the ticket to find out which ones don’t get worn. Yesterday, I wore a favorite top and skirt that I purchased several years ago. But I haven’t worn it in over a year because it is 2 sizes bigger than I am right now. I love this outfit so decided to wear it to work yesterday to see if I could get away with keeping it. It felt so awful that I decided to tell it goodbye. Now, I did contemplate keeping the skirt but thought that it would be better to donate it as an outfit rather than one piece of it. So, it will be going in the donate bin. I am so sad because it is beautiful but just doesn’t fit. I also have some shirts that fit well at the top but the waist just won’t go over my hips. Most of these are the free shirts I get from the charities that I work with. They, too, will go to someone else who will enjoy them more than me. I have to say, the clothes decluttering is hard because I am now down to the things I really love. Some I have been keeping “just in case”. Time to let go.